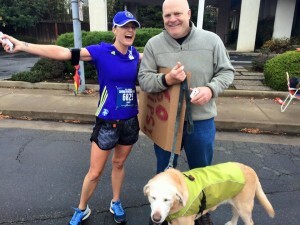 This year’s CIM brought no expectations. 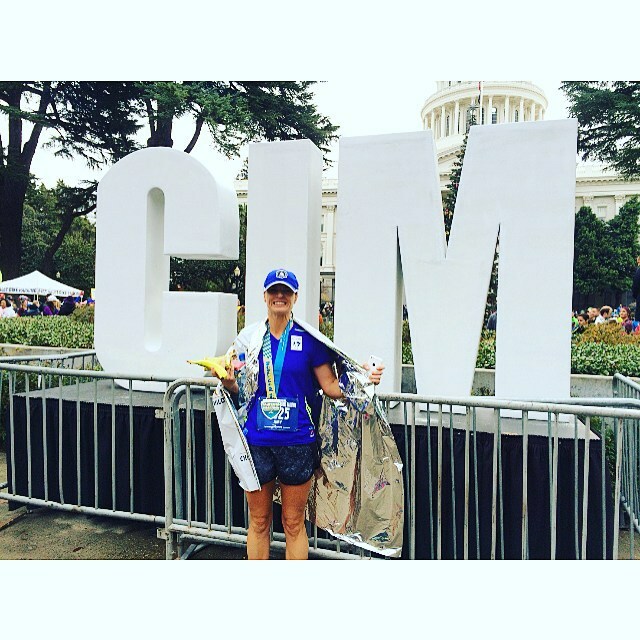 I had just run two marathons back-to-back three weeks prior (Athens & Istanbul) and had long work days leading up to the race so I had no idea how my body was going to feel running my last 26.2 of the year. I was feeling positive though so I knew no matter what I was going to have fun. 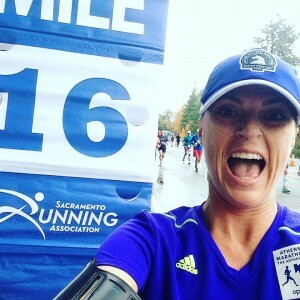 This is my hometown race and I get to see my friends cheering on the sidelines, fellow runners on the course, and I know the course like the back of my hand. This is something I miss when I run out of the country. I did my usual routine and prepped all my running gear the night before. I ate my pizza immediately after I got home from work about 7:30pm. I ate the same pre-race breakfast, except forgot to eat some banana. I even hydrated a ton the day before while I was working because the Nuun rep suggested I bring a water bottle and fill up on their free electrolytes all day at the expo. I was so glad he had suggested that! 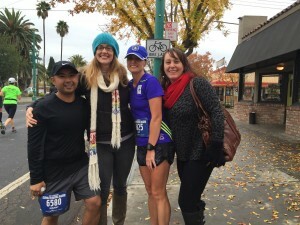 When we got to the start, Jen and I met up with her friend LaDawn and my friend Scott, who was running his first marathon. We got into the pack and took off at 7! Jen was feeling good and was going a little faster than I wanted to run, but I stuck with her for about 4.5 miles then I dropped back to run with Scott. I had told him I’d help him get to the finish line under 4 hours, which usually isn’t that hard for me to do. 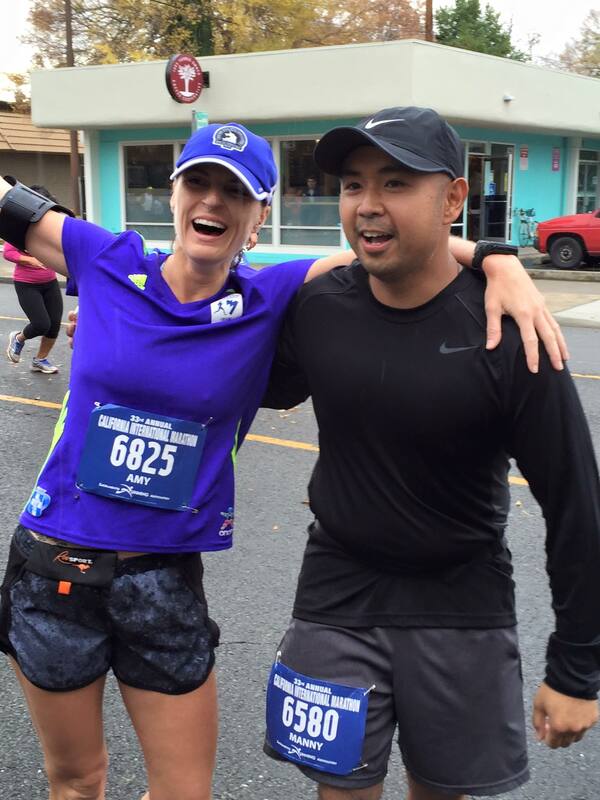 We were running a steady pace that felt very comfortable but around mile 13 my quads started to feel pretty heavy. I knew I wasn’t going to be able to keep this pace the rest of the way. So about mile 14.5 or so I told Scott to go ahead and try and keep up with my friend Brian. Brian just passed us and was slightly in front of the 3:55 pacer so I knew he could bring Scott home so he could reach his goal. I felt bad I had to drop back but I had to be smart and I knew my legs weren’t going to be able to take a harder beating of going faster. It just wasn’t going to happen. You feel better when you’re having fun! After Scott left me, I saw Deirdre Fitzpatrick from KCRA running and I said Hi to her. Then about mile 16 I thought it would be fun to take a pic of myself at the mile marker and posted to Instagram. At this point I totally didn’t care about my time and was just going to have fun. Not too long after, a fellow SRA ambassador, Leo, came up and we started running together (I ran with him earlier, as well, around mile 10). We were pretty much in the same boat and just wanted to have fun and finish, no matter how that happened. Around mile 18, I think, I was so hungry so I grabbed a handful of a brownie bite, orange slice, red licorice, and ate one of my chia surge gels. I have only been hungry during a race once before and that was in Paris, so this was weird. I saw Nuria (from Buffalo Chips and my Boston 365 group) and her husband and took a picture with them, then saw Katie and her crew from Team in Training, I fist pumped to a few bands as I ran by, then I came upon my friend Manny who was walking around the 21 mile marker. He was having a hard time, so I stuck with him. Then I saw Leo again and he joined us. It just became a party! As we were crossing the bridge, Tiffany, another SRA ambassador, joined us for a bit and we all chatted about our struggles, but none of us were negative or feeling let down. We were all smiling! We just sucked it up and made the most of it. We had to keep stopping to tend to Manny’s inner quad that kept knotting up. We rolled it out periodically with a small water bottle and he stretched on the railings. At this point we were in East Sac and this is where I get a little excited each year. My friends and Clint are always waiting at Bonn Lair at 37th and J with beers for runners and I get so pumped when I see them. It gives me some energy to get to the finish. We stopped this year and drank some Guinness as they videotaped the madness. 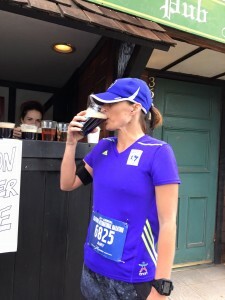 They were calling it #guinnessmile which makes me laugh! We now have an official hashtag for this stop on the CIM course. Manny downed the beer; I couldn’t finish it. But it was fun to see them for a few and then we took off. We turned onto Alhambra, saw my friend Katy and took pics with her. We were getting so close but it was still tough. Me and Manny – we’re smiling! As we approached the finish, Manny was still having a tough time with his quad, but I made sure he was okay and then I took off to the finish line. I was really happy to finish, although I never doubted I would make it, I just knew it was going to take a while. My time didn’t matter at all, having finished three marathons in a month (dumb! don’t do this!). If you really want to know, it was officially my worst marathon time. BUT! I was smiling the entire way, I LOVED how many friends I saw along the course and on the course, I got to chat with new SRA amabassador friends that I met this year, I ate lots of food on the course, I drank more beer at Bonn Lair this year than I ever had in the past (PR! ), and I’m just happy to continue my tradition of running the CIM each year. This is the only race I run every year. It makes me happy to continue my streak. It really was one of my favorite races that I’ve completed. Time is definitely not everything. While I love running abroad and seeing new countries, there is nothing like running in your hometown and having so many people supporting and cheering you on. I don’t get this when I run international races. I’m alone, can’t understand what people are saying as they chat to their friends while they’re running, it can sometimes get boring, and I have to stay super motivated. But, all of these experiences, whether abroad or in town, are what making marathoning (is this a word?) so magical for me. Every race is different and that’s what makes it an adventure and experience for me. These are the best experiences! My friend Scott and I chatted the next day after the race and he mentioned that he didn’t get to have as much fun as I did because he was so focused on his goal. I told him that’s what happens…you kind of have blinders on and don’t see what’s around you or get to laugh, smile and enjoy what’s going on. That’s why I mix up my races so I can have both experiences. 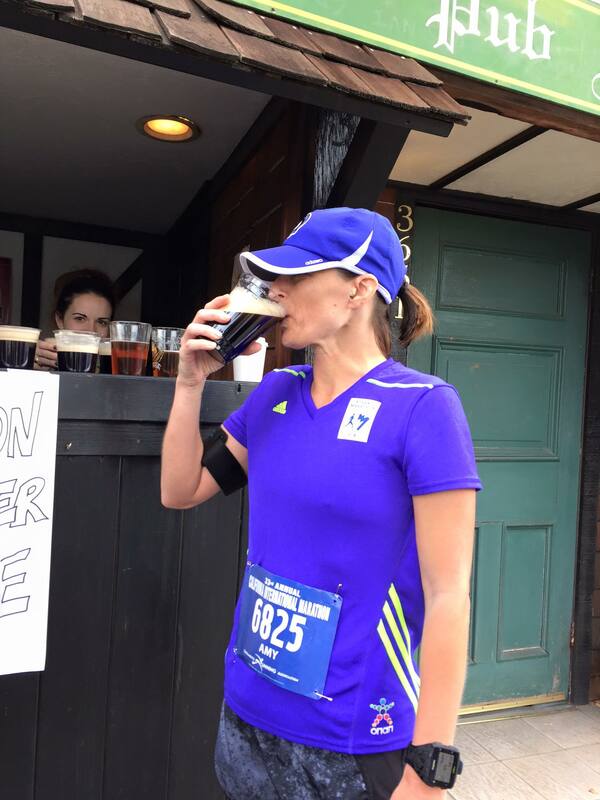 Cheers to all my fellow runner friends! You are all amazing! Keep chasing your dreams!